...It didn't work out so well for him. 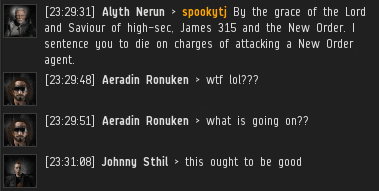 spookytj's failed assassination attempt against Agent Alyth Nerun didn't earn the rebellion any brownie points. 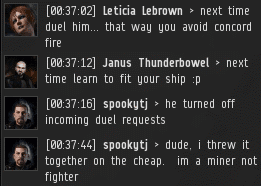 spookytj casually dismissed the idea that he should learn how to fit a ship, because he's a miner, not a fighter. Or as we in the New Order like to call fighters, "EVE players". The New Order does nothing in secret. 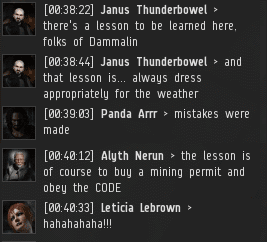 We do all our work in public view, for all highsec to see. This is efficient because it allows multiple players to simultaneously benefit from the lessons that our Agents teach. The next day, Alyth returned to the system to check up on the progress of his Raven-less new friend. spookytj was back to his old tricks, illegally mining with a Hulk. Upon seeing Alyth enter local, the miner greeted him in a scandalous manner. Alyth saw with his own eyes that the carebear had not turned from his bot-aspirant ways. He had no choice but to sentence spookytj to death. 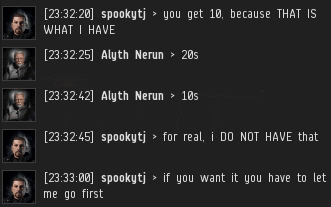 As Alyth was a bumper rather than a ganker, spookytj didn't take the threat very seriously. But you see, when spookytj performed that fail-gank the day before, Alyth earned a kill right. spookytj forgot about this. ...Alyth was only too happy to remind him. Upon receiving this reminder, spookytj's tone and attitude changed markedly. Alyth opened fire on spookytj and brought him to half-structure. 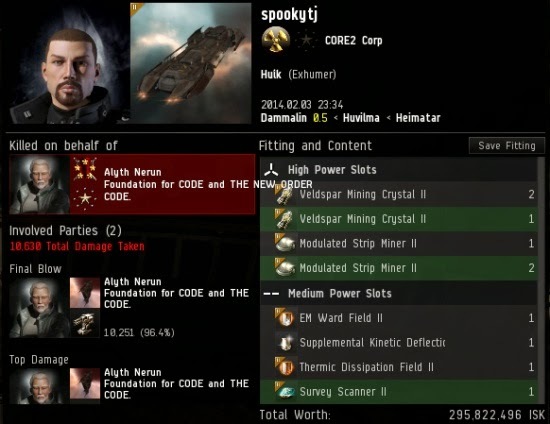 Then he gave spookytj the opportunity to purchase a mining permit and save his ship. Even at half-structure, the miner wanted to negotiate. He couldn't bear to part with his precious isk. Anyone who has ever held a ship for ransom will find spookytj's behavior here familiar. 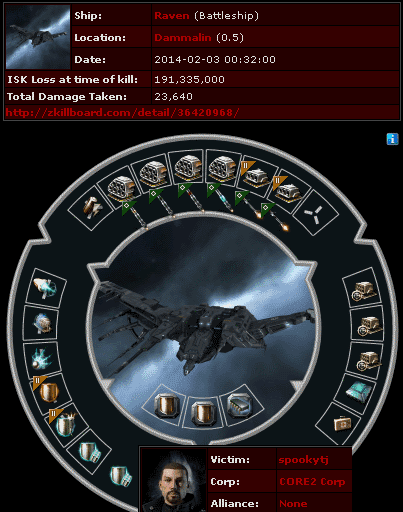 The day before, he was suiciding a 200 million isk Raven. 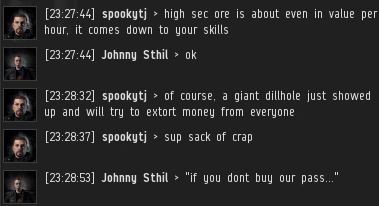 Today, he was mining with a 300 million isk ship and didn't have 100 million to spend on a ransom. Since spookytj was pinned down by Alyth's warp disruptor, Alyth took some time to perform a background check on the carebear. 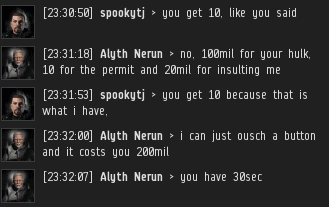 He claimed to have only 10 million isk. Was the claim credible? spookytj was a 2007 character. The guy had been playing EVE for more than six years. Carebear apologists would tell us that he was a "newbro". Alyth didn't buy spookytj's poverty routine. 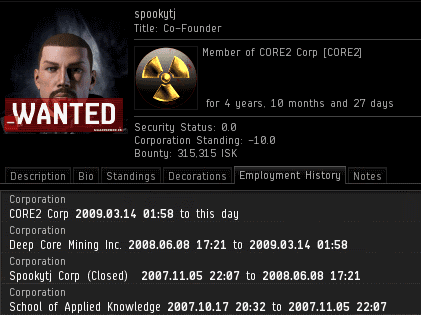 To his last, dying breath, spookytj was insisting that he only had 10 million isk. Scratch one enemy Hulk. Alyth killed the rebel on behalf of himself. Alyth was also permitted to destroy the enemy pod without CONCORD interference. Luckily, Alyth was still in a convo with spookytj, so they could keep in touch. In the heat of the moment, spookytj earned himself a spot on the Red Pen list. Instead of apologizing, spookytj doubled-down on the rebel rhetoric and insisted that miner bumping can't be countered. Yet the day before, he was saying that bumping was ineffective and didn't bother him. A good gank is like a shot of truth serum! The truth serum quickly wore off, and spookytj returned to his old bluster about bumping being ineffective. 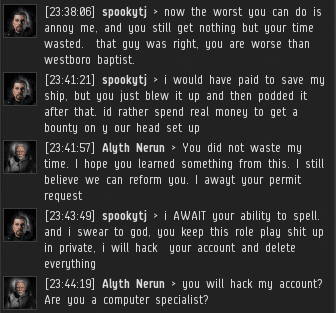 Before he ragequit, spookytj threatened to break the EULA by hacking Alyth's account. No need to worry. A carebear could never convincingly impersonate an Agent of the New Order. You can't fake the level honour and courage we possess. I agree John XIII, this is textbook stuff, and delivered off the cuff too! Persistence, coupled with an admirable familiarity with the CODE. and its provisions. The whole linked and expanded as always with humour and searing insight by - Our Leader, James 315, Supreme Protector, Saviour of Highsec. "now the worst you can do is annoy me"
I suspect the next chapter of "Spooked by the Code" will involve Alyth introducing Spookytj to a *proper* suicide gank. 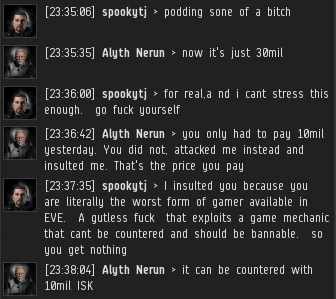 "It can be countered with 10mil ISK"
Classic! Spit my soda all over my computer screen I laughed so hard! My favourite line: " Luckily, Alyth was still in a convo with spookytj, so they could keep in touch." Burst out laughing. 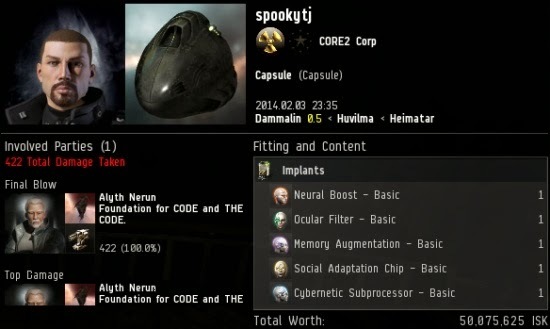 "It can be countered with 10mil ISK" was pure genius. Broke the EULA by threatening to hack another players account. 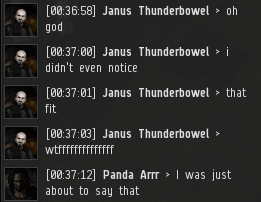 Has anyone notified CCP yet? I haven't heard anything, but I wouldn't be surprised if someone has already. It's quite surprising how quickly one can get convo'd by the very character you've been calling out in local and sending convo requests after you've bumped or blown them up. I guess they come back just in time to see the results of their actions and are forced to interact with their fellow players. I am sure you guys need to fit cargo expanders on your PvP fits just to hold all that honour of yours.